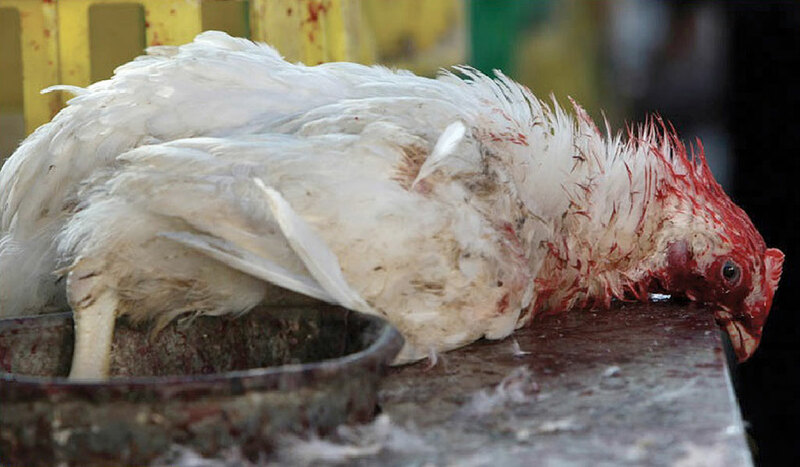 Our plea is prompted by the horrific cruelty to chickens at Kaporos sites year after year in New York City, Los Angeles, New Jersey, Chicago and everywhere the ritual is conducted. Thousands of chickens are trucked onto city streets from factory farms. They are crammed in transport crates without food or water for as long as four days. They are deprived of shelter from rain, heat and cold. Often their toes and feet are ripped off during the neglectful handling of the transport crates where they sit miserably immobilized in their own feces. Many die in the crates of starvation, dehydration, heat stress, and fear. This year the ritual takes place the week of September 25-29, 2017. The mistreatment of the chickens before, during and after the Kaporos ritual, when many are left alive, writhing and crying on the ground, violates the New York State animal cruelty law and desecrates the Torah mandate of Tzaar Balei Chayim, which forbids causing unnecessary pain and suffering to animals. It violates the Talmudic mandate that one must feed one’s animals before feeding oneself. Despite claims that the chickens are donated to the poor, most are trashed. A 2016 investigation found that at Brooklyn’s largest Kaporos site in Crown Heights, two thirds of the slaughtered chickens were stuffed in plastic trash bags. Local media filmed slaughtered Kaporos chickens being picked up by a company whose employees said the corpses would be turned into biodiesel. Dozens of trash bags full of dead birds were loaded onto the truck. The lack of refrigeration at most Kaporos sites means that the birds cannot legally be used for human consumption regardless. In light of these facts, many rabbis have come out against the use of chickens for Kaporos including some who once used chickens but now use money.Please urge the following associations to join these compassionate rabbis by opposing the use of chickens for Kaporos and encouraging the use of money instead. Sign our petition, adding your voice to thousands of other caring people who have signed it! If you have access to the Internet, please sign our petition to the above-listed rabbinical groups. Go to www.endchickensaskaporos.com/2017petition and click on the change.org link Urge Jewish Community to Do Kaporos with Money, Not Chickens. Fill out the short form, hit the Signature button, and that’s it!